This trip was originally planned for Tuesday the 26th, but the forecast (which turned out to be a bit wrong) was for rain, so we moved it to Monday. We made that decision a couple of days in advance, and ended up having two extra people join our happy crew! The group had several expert river-pickers along. Susan, as is often the case, came up with the most valuable find of the day, a brand new rain jacket that fit her, complete in its own stuff sack. Her husband Gerald found a beer cozy with a rather gross message - a souvenir of some guy's bachelor party. 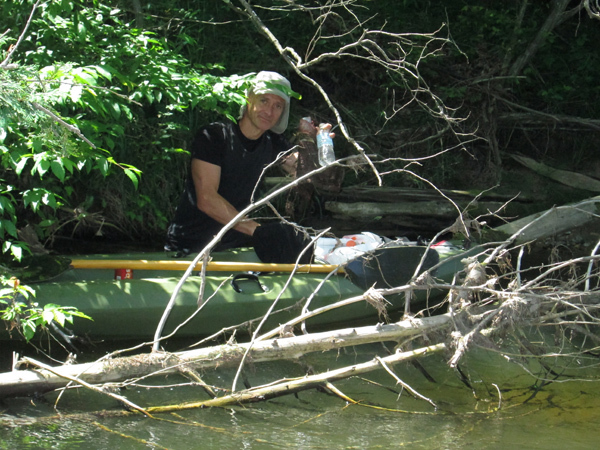 Given all the beer cans we found (both full and empty), we wish that such parties were confined to homes, where the guys would not be littering the river, and where they wouldn't be driving home afterwards, clearly under the influence. 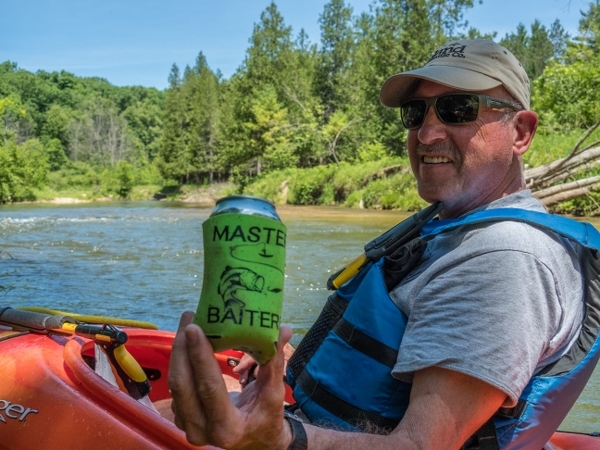 We also wish that the Forest Service would ban all alcohol on the Pine River; it would cut down on both litter and rowdy behavior that often results in capsizes. 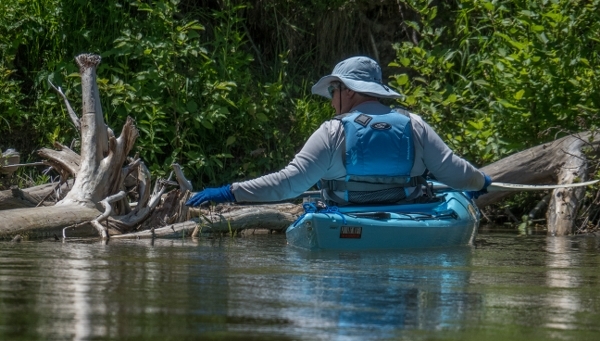 That's how a lot of stuff ends up in the river; we believe that most folks simply tip over and then their stuff goes flying. Actually, prohibiting all disposable containers would be even better, since we find lots of water bottles too. There were several glass bottles, chip bags and the ever-present flip-flops. Fish lures and hooks, and hats are also common. There was one kayak paddle that Sue and I tried to retrieve, but it was in deep fast-moving water, so it will have to wait for another time. After working on it together for several minutes, we decided that it was not safe to make any more attempts. And then there was the team of Kurt (the climber) and Darrell (the catcher). Kurt is fearless, going where no other man is willing to tread, and mucking around in dicey log jams to find all the biggest "mother lodes". 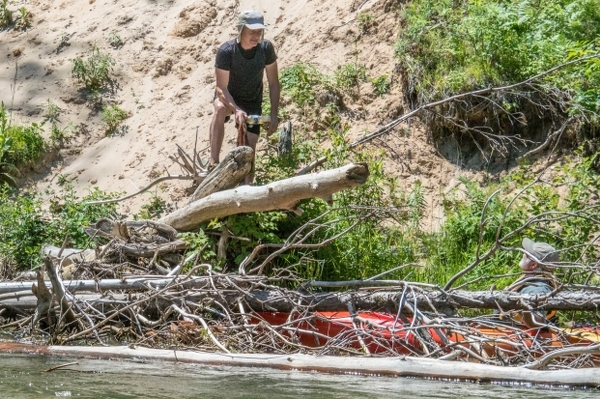 It was good to see Darrell, on his first Pine trip ever, being willing and able to park his kayak in just the right spot to retrieve all the flotsam that Kurt was tossing to him. Dawn had never been on the Pine before, or on a TAPC cleanup, so it was wonderful to see her get in the swing of things, and locate cans in tight spots. I particularly appreciated having her as a support team when I had to maneuver into a downed tree to stretch and reach for a few cans, visors and bottles. 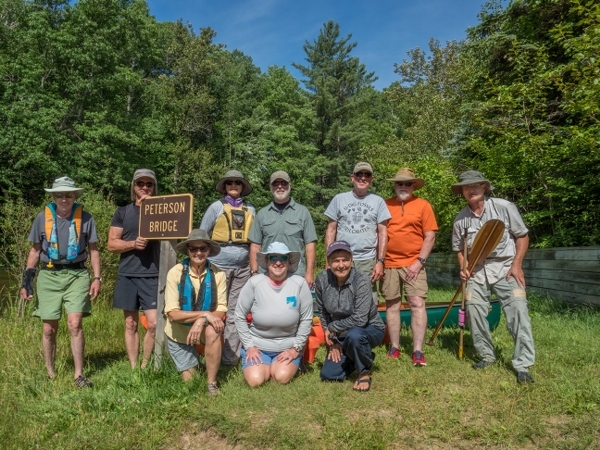 It was also neat to show D&D the exact location of the former Stronach Dam, which paddlers had to portage until 2003. Now it is almost impossible to tell where the dam used to be, since the vegetation has reclaimed the entire area. Terry M picked up a bunch of stuff before lunch, and had to boogie on afterwards, but she did leave a good-sized stash for us in a large plastic bag. Luckily she has a nice little kayak, and very good balance, since I noticed a tremendous recovery once when she got up on a log sideways. Nobody got wet, unless they wanted to. And not to be forgotten were John G and Glenn, masters of the solo canoes and sweeps of the day. We SO appreciated knowing that they were back there in case anyone might get into trouble. They also served as the "barges" for the groups, and by the end, their boats were weighed down by hundreds of pounds of trash. Note to everyone: when those last folks arrive at the takeout, please be there to help haul up the stuff to the parking area. This is the stuff that was sitting in Glenn's canoe at the end. 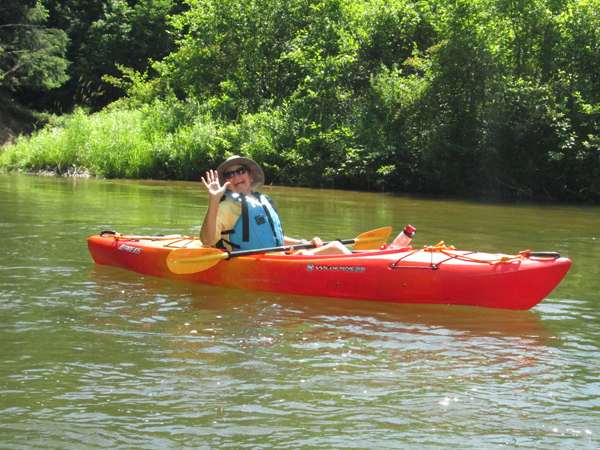 Glenn found a kayak paddle that belonged to the kind folks at Pine River Paddlesports Center. 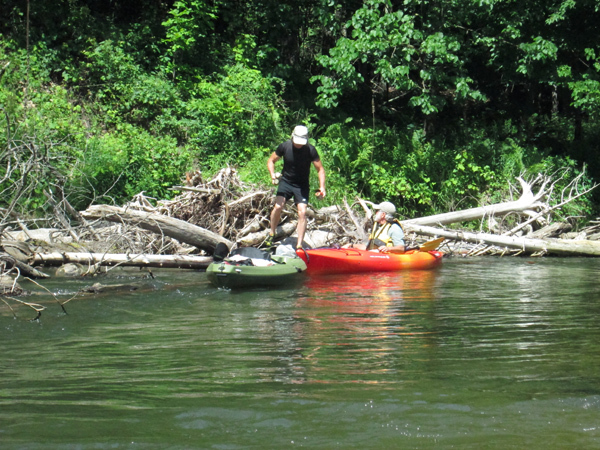 As we were unloading at Low Bridge, another kayak group saw our pile of debris, and was very impressed; they took a TAPC rack card and also returned the paddle to PRPC for us. Speaking of which, it was wonderful to have Mark Miltner do our shuttle for us to thank us for our stewardship of the river. He and his crew are the ones who do the safety work on the river, so that the fallen trees don't completely obstruct the path for kayaks, canoes and rafts. We would never be able to paddle the Pine without their assistance. John & Lois rounded out the team. Unfortunately one of their walkie-talkies had been lost on the trip the previous day, so lunch came a bit later than usual. But nobody went away hungry. BTW, they bought new units on the way home. We didn't think that we would find much stuff on this gorgeous day. 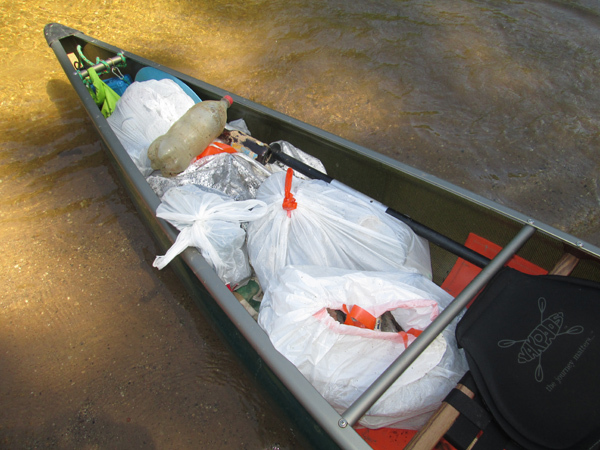 After loading up our boats and gear, John & I collected everything into 6 large "National River Cleanup" bags. 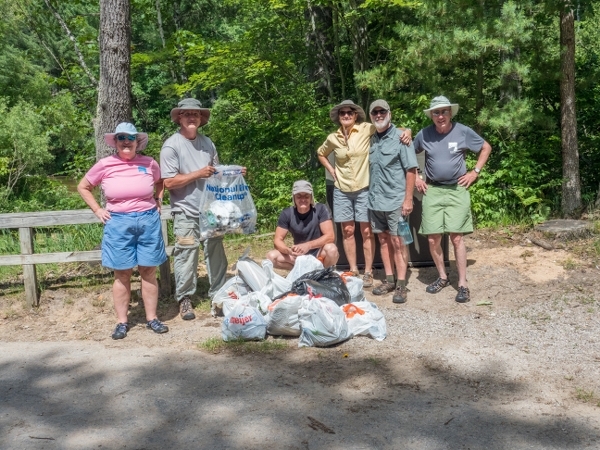 We spoke to the rangers at the Huron-Manistee National Forest (they also give us free watercraft permits and parking permits), and they were able to pick everything up later that afternoon. We were on the river from 10:30 until 3:30, but it didn't seem long at all, In fact, the best comment I heard as we were approaching the take-out was, "Aw, are we done already?" That's the sign of a really wonderful trip! Thanks to all who participated. Report by Lois, pictures by John H and Glenn.